Schwartz Harbaugh handshake: The dumbest thing about the NFL's latest dumb controversy. Schwartz Harbaugh handshake: The dumbest thing about the NFL’s latest dumb controversy. The dumbest thing about the NFL’s dumb handshake controversy. Photograph by Leon Halip/Getty Images. 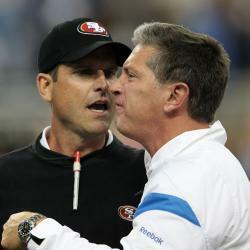 On the subject of coaching snits, the NFL has decided not to fine the 49ers’ Jim Harbaugh and the Lions’ Jim Schwartz for their handshake foofaraw. For the last 48 hours, the postgame shows and SportsCenter and the NFL Network have asked every possible question about the postgame shake, slap, and chase. Are these ceremonial handshakes necessary? What are the rules of backslapping? Was Harbaugh’s enthusiasm a product of his collegiate background? Should Schwartz apologize? Should Harbaugh apologize? How would the coaches fare in the World’s Strongest Hands competition? Mighty Mitts? The Münsterland Grip Challenge? By this time tomorrow, the Detroit Shakedown will have its own logo and theme music, as well as a daily highlight show hosted by Jim L. Mora and David Gergen. (I believe this is how Nightline started.) I’d argue that the ubiquity of ex-NFL coaches on television—the Fired NFL Coaches Full Employment Act mandates that every man with a whistle gets a TV job no more than five minutes after he’s laid off—is the main reason this kerfuffle is getting so much attention. Asking a coach to talk about handshake protocol is like inviting a car salesman to tell you about the 10-year limited warranty. This is the question Steve Mariucci and Brian Billick have been longing to answer, if only someone cared enough to ask. The NFL Network’s Mariucci was so jacked up to talk handshake etiquette that I was worried he might have an on-air aneurysm. I don’t think any TV pundit has been this excited since the last time Anderson Cooper felt hurricane-force winds. I have less of a problem with the volume of handshake coverage than with the level of seriousness therein. The networks should replay those five seconds of mesmerizingly stupid macho posturing until the tape disintegrates. They should not use this as an occasion to have a serious debate about anything. OK, fine—so long as we’re all here, I’m going to argue that it’s unseemly for slacks-wearing sideline prowlers to playfight after their teams have torn apart each other’s ligaments. Sean Payton’s leg explosion shows that coaches do take a risk by standing on the sidelines. It’s not much of a risk, though—the guy holding the play sheet isn’t generally the one suffering from dementia. As a consequence, coaches should know their place. Players can’t get enough of rah-rah, one-of-the-guys chest-bumpers like Harbaugh and Pete Carroll and Rex Ryan. But the fact that players love their antics doesn’t make them players. I prefer my coaches imperious and aloof, their distant stares an acknowledgment of their off-field authority and on-field insignificance—Tom Landry in thoughtful silhouette. On Sunday afternoon, Jim Harbaugh and Jim Schwartz watched a bunch of men in uniform kill each other for their benefit. Coaching is an intellectual challenge, not a physical one. If you’re not wearing a helmet, it’s best to run off the field before anybody notices that you’re getting the glory without showing any guts.